Enjoy local hospitality during a wonderful experience in Los Cabos when you choose the comfortable facilities at Park Royal Los Cabos. This charming hotel offers excellent guestrooms and services, as well as a great location just a five-minute-walk from the destination's beautiful beaches. On the premises you'll find an impressive array of useful features, including a restaurant, a bar, a swimming pool, and Internet access. 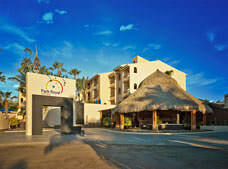 Make your booking at Park Royal Los Cabos now and have a well-deserved vacation at this paradise-like place. Relax and enjoy a fantastic vacation in this stylish room. With a full kitchen, a tastefully decorated bedroom, and a spacious living area, these rooms are ideal for a relaxing and enjoyable vacation to Los Cabos. These rooms feature everything you need for an incredible vacation in Los Cabos. The services and amenities included range from a rain shower to an electric grill and a whole lot more.